A Drop of Honey was created especially for a subset of the Allegra Chamber Orchestra– one of the only all-female professional orchestras in the world, based in Vancouver, Canada, directed by Janna Sailor. The piece was written for a special concert, “Songs for Scheherazade”, as part of Vancouver’s Indian Summer Festival. A Drop of Honey is loosely based in Raag Charukeshi, a scale used in classical Indian music, with a sharp 3rd degree of the scale, and a flat 6th and 7th. The music develops slowly and gently, through an introduction and a couple of shorter, improvised alap sections in the sitar, building into a steady tempo. Toward the middle of the piece, an ancient pavane melody, “Belle qui tiens ma vie”, by French composer Jehan Tabourot (1520-1595), makes its appearance in the strings and clarinet, before morphing back into the Charukeshi scale. The piece continues to build up to a quick-tempo jhala conclusion. A Drop of Honey received its premiere by Allegra Chamber Orchestra, with Saina Khaledi (santoor), at the Ismaili Centre, Burnaby, British Columbia, Canada, on July 15th, 2018. (Note: the piece was originally composed for sitar, but a santoor was substituted for the premiere performance). 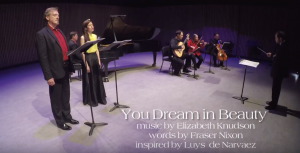 You Dream in Beauty was selected as the winning proposal for a new piece, in a composition contest sponsored by Erato Ensemble, a Vancouver-based art song/chamber music ensemble. The piece was conceived as a modern reinterpretation of Luys de Narváez’s Cancion del Emperador, originally written for vihuela, in 1538. Its melodic material is reworked and reimagined here with an expanded instrumentation (two voices, guitar, piano, violin, and cello), and set to a poem written in villanelle form—the villanelle form being something that originated roughly around the same time as the Cancion del Emperador was composed. The poem was written specifically as text for this new piece, by Vancouver-based author Fraser Nixon. You Dream in Beauty received its premiere by Erato Ensemble, at the Orpheum Annex, Vancouver, Canada, on May 26th, 2018.
on some farther western shore? Two Fiddlers was based on a simple, modal melody, intended to recall traditional East Coast Canadian fiddling. The left hand, when it enters, brings a few more interesting harmonies, outside of the modal scale the right hand is using. Partway through the piece, the left hand (or “second fiddler”) crosses over the right hand on the keyboard and takes up the main melody. Metrical changes, offbeat accents, and the tradeoff of melodic material between the “two fiddlers” add to the playful spirit of the music.